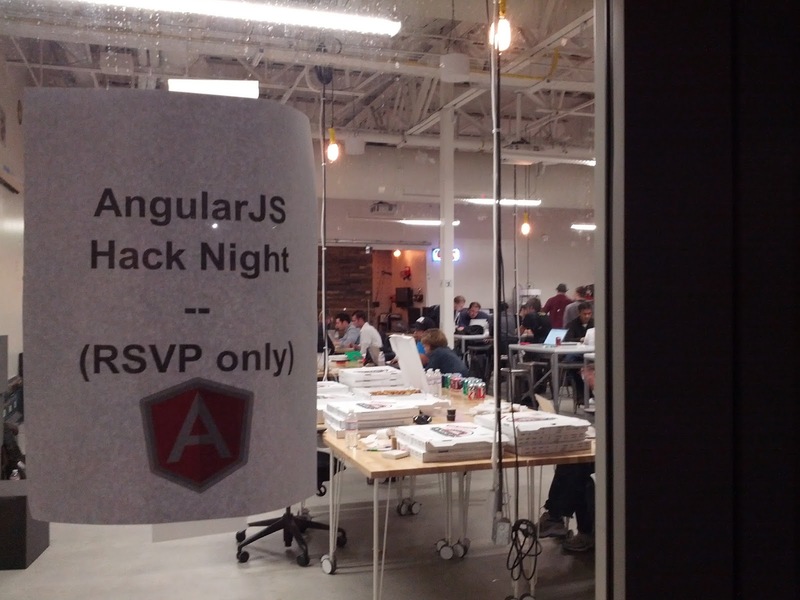 For our first California meetup of the year, we thought we'd try something different and host a Hack Night. Presentation style meetups are great for a deep dive into a single topic, but it can be hard for people to get to know each other or dive into a thorny problem during a short Q&A. We wanted to try a less structured format, where people could just bring a project to work on and get some help from each other and from our experts. 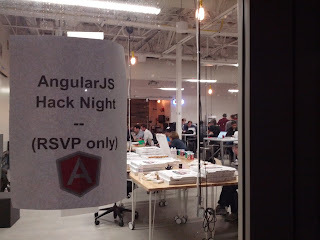 If you have an active local developer community with a few willing experts, you might try a Hack Night as an alternate format for your next meetup. Check out the photos from the event to get a feel for what it was like to be there. We had a wide range of projects: mobile feature development, multi-user gaming, simple apps and complex ones. One team gave us a super cool demo of a new project about to launch, all based in Angular. We're sworn to secrecy, but we can't wait to share their blog post with you. Greg Weber, who spoke at the November meetup, updated his statechart library with AngularJS routing. Sean from the iUI web framework project wanted to work on integrating iUI with Angular.js. He came with some philosophical questions around the best way to support the $injector service. Dean Sofer and the AngularUI folks answered a ton of questions and worked on merging some of their outstanding pull requests. Dan Doyon and David Nelson worked together to get an infinite scroller working in an existing app. Tom worked on a mobile app to help language learners build vocabulary. Several projects doing Angular/MongoDB integration. All in all, it was an interesting change of pace from our usual routine. It was inspiring to walk around the room at the end and see what people had built in a short time. I'm really looking forward to seeing how the community develops at the next one. It's useful to have few experts on hand who can focus on interacting with people and helping with questions. We asked people to tell us what they were working on before adding them to the event list. We then posted the answers on the wall at the meetup to help people get to know each other. You can order AngularJS T-shirts and stickers from the same suppliers we use. Or download our creative commons licensed logo art and make your own. Check out the FAQ doc on angularjs.org for details. We've recently started a discussion label for "Hosting an Event" under our AngularJS Community on Google+ with tips for event organizers. Announce your Hack Night on the wiki Events page and share it with us on Google+ so that we can help you spread the word! Two of our attendees from Austin, TX just happened to be in town for business and were able to join at the last minute.